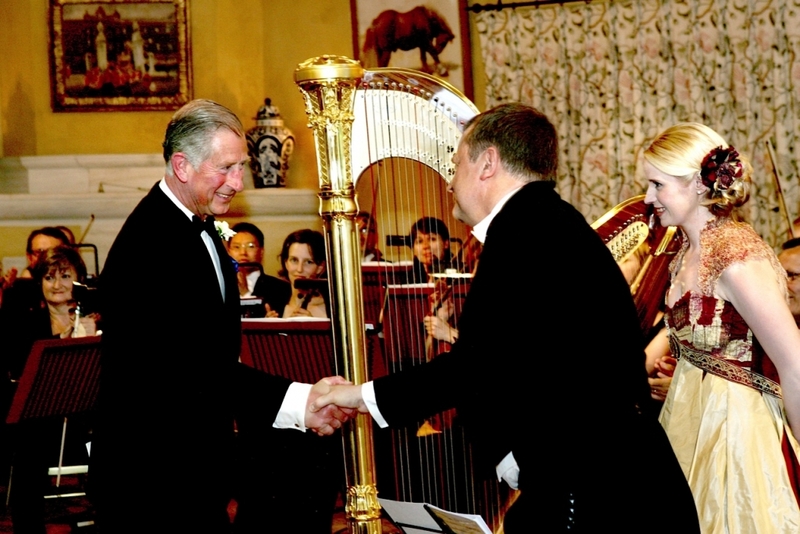 When I first visited the Highgrove gardens in the summer of 2008, I was looking for inspiration for a new work for harp and strings. To my mind, the florid sounds of the harp and the rich texture of a string orchestra immediately lent themselves to a horticultural theme, and so it was The Stumpery with its mystical, timeless atmosphere that gave rise to Goddess of the Woods, named after the beautiful statue which sits in this wooded glade surrounded by ferns, gnarled tree stumps and a pair of mischievous leprechauns. With the decision to convert this one piece into a four-movement suite came further visits to Highgrove, and I was thoroughly inspired by witnessing the different seasons weaving their individual characters into the landscape of this special place. The second movement The Wildflower Meadow is a ‘paen’ of joy, sometimes tinged with nostalgia and a sense of wonder. Here the garden is at its most free – free to rejoice in its own shapes, textures and colours and relatively free to grow without man’s interference. The Sanctuary sits in the magnificent arboretum. The lofty, sweeping trees almost create the effect of a great cathedral, and sitting humbly within its walls is the chapel built by His Royal Highness to mark the new millennium. Above the entrance to The Sanctuary are the words ‘Lighten our darkness we beseech thee O Lord’ which are taken from the Third Collect at evening prayer and it is this prayer which forms the foundation of the third movement. The central melody is, in effect, a plainsong setting of the words, and the slow-building climaxes within the music suggest that this is a place which can touch the heart deeply. The statue of The Gladiator has always fascinated me – so handsome, majestic and fearless. One January morning, in thick snow, I followed its line of sight down The Thyme Walk to the house itself. It was then that the strident bass patterns of this last movement came to be together with the defiant and energetic harp and string melody. The Gladiator is portrayed mid-stride. He is almost alive, communicating with the birds and calling to attention the armies of topiary which stand in defence o the house. In the same way that The Goddess of the Woods distils her gentle magic into the air, so The Gladiator radiates strength and dignity, promising that the garden and all it represents will remain safe and fruitful for generations to come.